To view this video, visit https://www.youtube.com/embed/Zxgq2v2Tai0?rel=0&showinfo=0. All messages are about something (the subject) and are trying to do something (the purpose). Whether you are reading an article, watching a commercial, or listening to a speech, you should think about the subject of the message and its purpose. 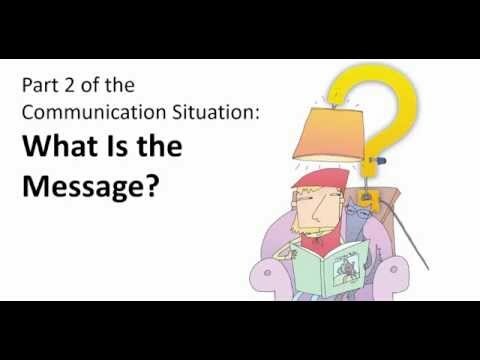 Watch this video to understand how you can analyze any message. What is the message about (its subject)? What was the original sender trying to do with the message (its purpose)? Can you trust this message based on its subject and purpose? Is the message now being used by another sender for a different reason? (For example, does your teacher have a different reason for presenting this than the original sender?) If so, what is the new purpose? If you showed this message to someone else, what would be your purpose? Understanding a Message's Subject and Purpose by Thoughtful Learning is licensed under a Creative Commons Attribution-NonCommercial-ShareAlike 4.0 International License. Based on a work at k12.thoughtfullearning.com/minilesson/understanding-messages-subject-and-purpose. Who Is Sending the Message? What Medium Should I Use? Who Is Receiving This Message?